Our team has studied Scarlet Macaws for over three decades. From our research we know that over 20% of all Scarlet Macaws which hatch die of starvation. Starvation is the most common cause of death for wild macaw chicks. Parents always raise the first chick that hatches, but 45% of second chicks, nearly all of third and fourth chicks are left to starve to death. We hypothesize that we can move chicks at risk of starvation from one nest to foster parents with one chick to increase their chances of survival. Now, we are working on developing new techniques to deal with chick death by starvation. However, we need your help to finish development and testing so these techniques can be used to save macaws and other parrots around the world. In Mexico and Guatemala, Scarlet Macaw numbers are critically low. The population numbers are below 500 birds total 1. It is too risky to test new field techniques in areas with rapidly declining populations. We work in the Tambopata region, where the populations are not decreasing yet. This gives us a unique advantage to test whether or not we can increase the survival of macaw chicks by moving the third and fourth chicks to nests with one or no chicks. If successful, this technique could be used in areas where Scarlet Macaw numbers are critically low to help bring back the population. While writing this proposal we were contacted by two projects in Costa Rica hoping to use our techniques as soon as they are tested. Our main goal is to increase survival of wild Scarlet Macaw chicks by thoroughly developing and testing new techniques that help to reduce wild macaw chick starvation. We estimate that there will be at least 5 chicks at risk of starvation this coming breeding season. We aim to translocate all these chicks to foster parents. Macaw nests will be checked every day after the first chick hatches in order to find second and third chicks as soon as they hatch. The chicks selected for translocation will be removed from the nest and raised by researchers until they are ready. At this point, they will be placed into their adoptive nest and the family will be intensively monitored using video cameras installed in the nests to ensure that the new chick is successfully adopted. Wood and labor to maintain/repair macaw nest boxes used by the breeding adults. Tree climbing equipment: ropes, harnesses, carabiners, digital camera, hard drives. Surveillance video cameras for inside nests, waterproof cases for video equipment, portable video monitor, car battery and video assistant stipend to monitor progress of translocation process. Hand feeding formula & supplies, chick measuring equipment to track macaw chick growth, chick brooder, and car batteries. 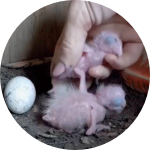 Avian veterinary to raise/ check health of newly hatch macaw chicks. If we raise more than our target value, we will be able to continue our work through the next macaw breeding season and save even more macaw chicks from starvation. The Tambopata Macaw Project is a preeminent example of successful parrot conservation. 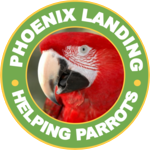 Phoenix Landing has been a proud sponsor of its work for many years. This new project will help many more macaws survive in their native habitat, and likely serve as another great example for others in conservation and research. Please support it! The opportunity to contribute to this project is also an opportunity to affirm our commitment to the planet's flyers, who so badly need our help. Turn the feeling of being thankful into a verb by "doing," and contribute asap. As one who has worked with the Tambopata Macaw Project and with the declining macaw populations in Guatemala, I strongly support this project. The team working in Tambopata is very experienced with these macaws and offers great hope for saving these majestic birds. I am really excited about this research. I believe it will provide information and options for continued conservation of parrots in the wild. The macaw project has been and continues to be a leader in the study of and conservation of large parrots. The project will last approximately 4 months, from mid December 2017 to mid February 2018. We predict that first macaw chicks will be hatching by late-November. So we will have third chicks hatching by mid-December, with the possibility of more late hatches by mid-January. Chicks will be translocated into their adoptive nests approximately 15 days after hatching and will continue to be monitored using video cameras placed inside their nests until they fledge. The Tambopata Macaw Project is a long term research project on macaw and parrot conservation and ecology in the lowlands of southeastern Peru. 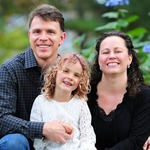 It was founded by Eduardo Nycander in 1989 and directed by Dr. Donald Brightsmith since 1999. Its work with parrots and macaws, local communities, and government agencies has provided many insights into various aspects of these wonderful macaw and parrot species in the wild. I was lucky to grow up spending much of my time outdoors in New Zealand and developed a love for animals and the natural world at a very young age. This grew into a strong drive to conserve biodiversity and whole ecosystems. I believe we have a responsibility to protect the environment and the entirety of the life within it. After I received my wildlife biology and conservation ecology degree at La Trobe University in Australia, I was drawn to the lowland jungles of Peru because of their high biodiversity. Since then, I have been volunteering for The Tambopata Macaw Project because I believe this work is so valuable to the long-term conservation of parrots and macaws, which has a positive impact on whole ecosystems throughout Latin America. The people involved in this project are experts in their field and work extremely hard to gather reliable scientific data which can be used to help parrots worldwide. I know that they truly appreciate every single cent given and will ensure it goes a long way to helping these species. I am a tropical ecologist and conservation biologist who works on a variety of topics in parrot conservation, health and welfare. Back in the early 90's I read a book called "Neotropical Parrots in Crisis" and I realized that this family of beautiful, smart and charismatic birds were in great danger of extinction but we knew very little about them. So, I decided to dedicate my career and my life to study them in the wild and captivity and to promote their conservation. Since 1999, I have directed the Tambopata Macaw Project in the Amazon rainforest of Peru. There, after decades of hard work in the field, we have discovered many interesting aspects of macaw and parrot natural history. We are eager to use this information to implement management techniques to increase macaw and parrot populations that are declining throughout the Americas. Many colleagues are interested in using this information as well. We have the science, we know what to do, now we need your help to make it happen. I consider myself a parrot lover and wild psittacine researcher. I have been around parrots since I was 5 years old and I have been working with them in the wild, as part of the Tambopata Macaw Project, since 2003. 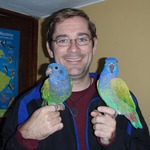 I have also worked with parrots and macaws in captivity. For the last 12 years, I have dedicated myself to the study of Scarlet Macaws in the wild in my native Peru, to try understand their breeding strategies and breeding behavior. Through all these years of hard field work, we have gathered unique scientific information that we are now using to design management strategies to help wild populations of Scarlet Macaws increase in numbers. I am very excited that we have the chance to apply all the knowledge we have about this macaws to have a real impact in wild populations that are in trouble. I truly believe we have the knowledge to help them. 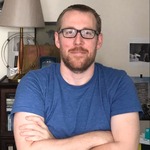 Keith was born and raised in New York, educated in philosophy, and now works in the visual arts. From 2002-2003 he climbed trees in the rainforest of Peru as a member of the Tambopata Macaw Project. 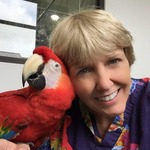 Dr Janice Boyd is a researcher on parrot conservation and parrot genetics issues at the Schubot Exotic Bird Health Center at the Texas A&M Veterinary School. She also is president of the nonprofit 501(c)(3) Amigos de las Aves USA, also known as simply the Parrot Fund, that supports projects on wild and ex-situ parrot conservation and health, particularly in the Neotropics. 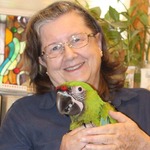 She has been a key collaborator of the Tambopata Macaw Project since 2000. The Tambopata Macaw Project is one of the longest running parrot research programs in the Americas and our research has been making a positive impact on Scarlet Macaw populations for almost 30 years. Since 1989, we have studied wild Scarlet Macaws in the lowland rainforests of southeastern Peru 1 . Since 1999, under the direction of Dr. Donald Brightsmith, the project has been instrumental in determining the life history traits, breeding behavior, chick growth, and development of Scarlet macaws 2,3,4. During this time, we have been able to discover so much about how this species live and interact in the wild 5,6,7. Besides this, we have been able to contribute to their conservation and help other projects use our techniques to help their own populations 8,9. We trialed this new ´chick adoption´ program last year and the results are very promising: nearly all of our adopted chicks survived. Now we are asking your help to run this program on a larger scale, to save more Scarlet Macaw chicks and allow us to share this vital information with other conservation programs around the world. Please help us reach our goal for saving Scarlet Macaws. $5 will help buy supplies for hand-feeding macaw chicks. $10 will help to buy supplies for health monitoring and equipment to keep them warm. $25 will help buy equipment to keep track of their growth, development and health. $50 will help buy new wood to repair Scarlet macaw artificial nests each season so that they have somewhere to raise their young. $250 will help buy camera equipment to put inside the nests so we can make sure adopted chicks are been take care of properly. You know how important it is to conserve this species, but not everyone does. Please share this campaign via Facebook or email to anyone you think might want to help. Thank you so much for donating to our campaign.